I received a real life golden ticket! In the Spring I spent an afternoon sipping and eating chocolate with my chocolate connection at the famous bespoke cake company. 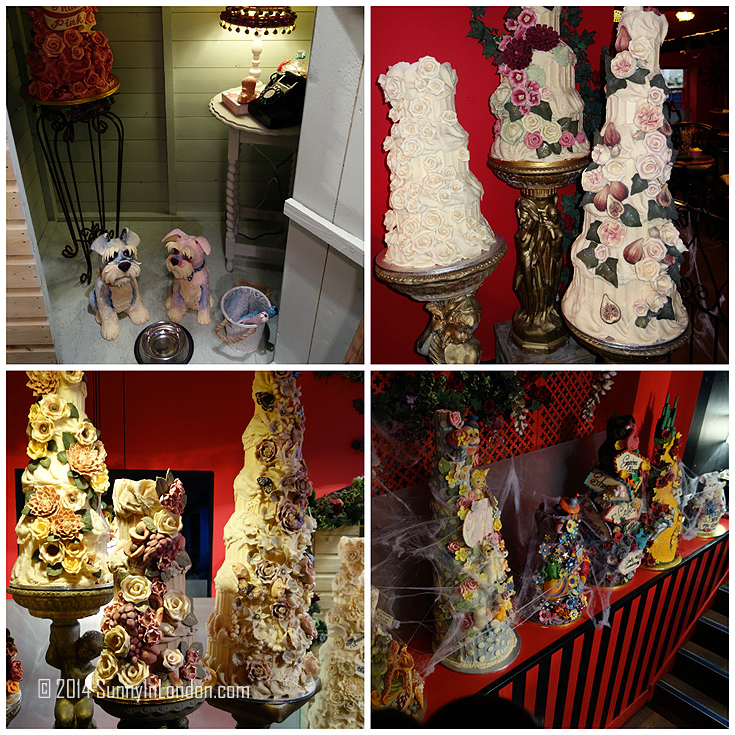 I learned about how Choccywoccydoodah originated, grew and turned in to a famous television reality show about making chocolate and cake. 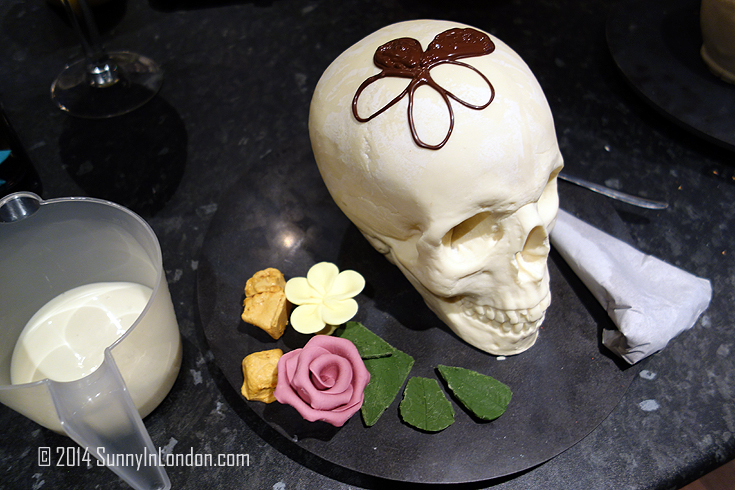 After my blogger advice and expat related posts, the Choccywoccydoodah feature is one of the most popular stories on Sunny in London. So, I made sure to RSVP immediately and coordinate a trip from London to Brighton for the exclusive event. 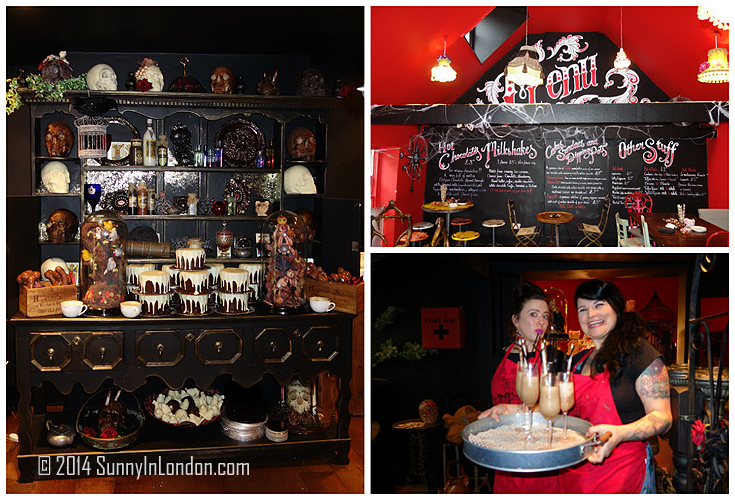 I spent the whole week wondering what the fabulous crew of Choccywoccydoodah would cook up in their Witches Kitchen. I also ran 4-5 miles every day and drank kale shakes so I could indulge during my visit. I had been to Brighton three years ago with Mr. Sunny. 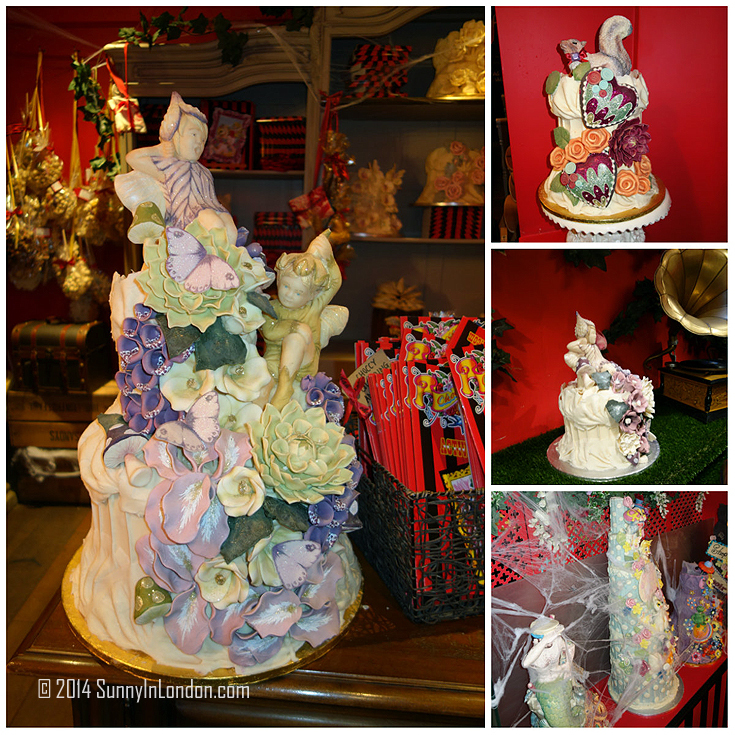 But we didn’t have the opportunity to visit Choccywoccydoodah. As I headed down a tiny alley following my iPhone Maps, I guessed the chocolate shop was at the end. Yes! 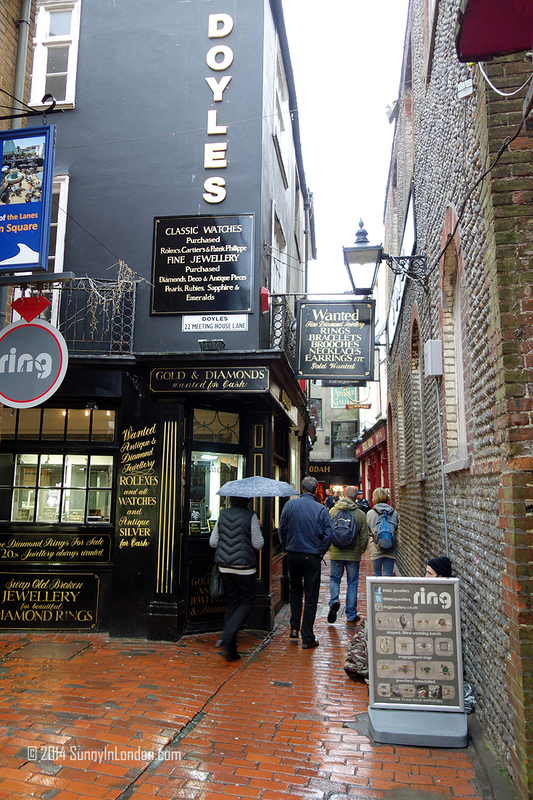 I felt a bit like Harry Potter in Diagon Alley. The word to describe the chocolate shop is majestic. 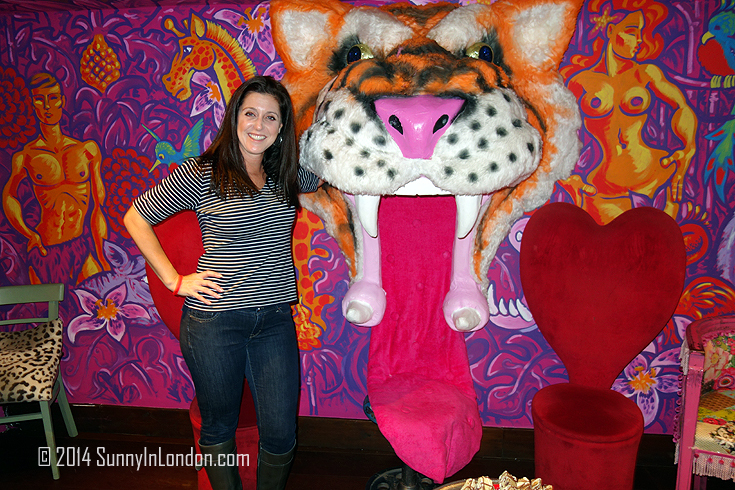 Just like their Carnaby Street London location, the walls are covered with vibrant colours and art. I received a special armband and was whisked upstairs to the private event. Well, I can’t say I’ve ever heard that one before. Have you?! 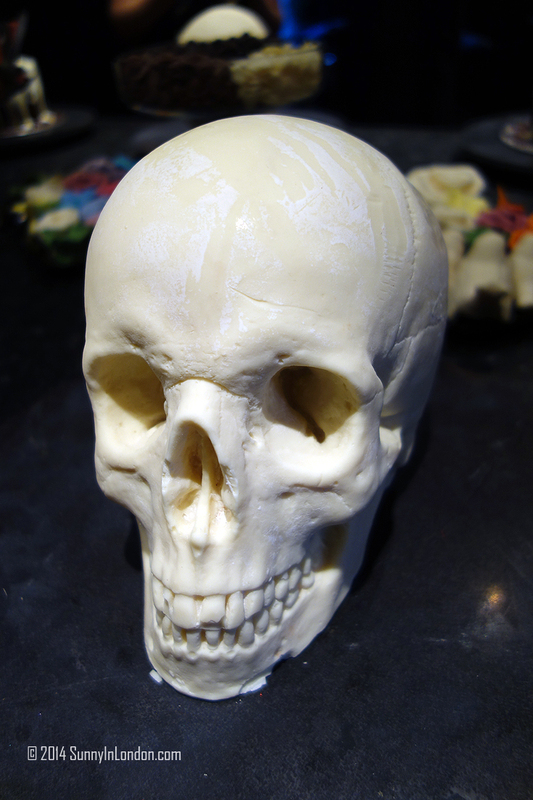 Nearly all of us picked a white chocolate skull. There was one lonely cakester. Silly blogger. 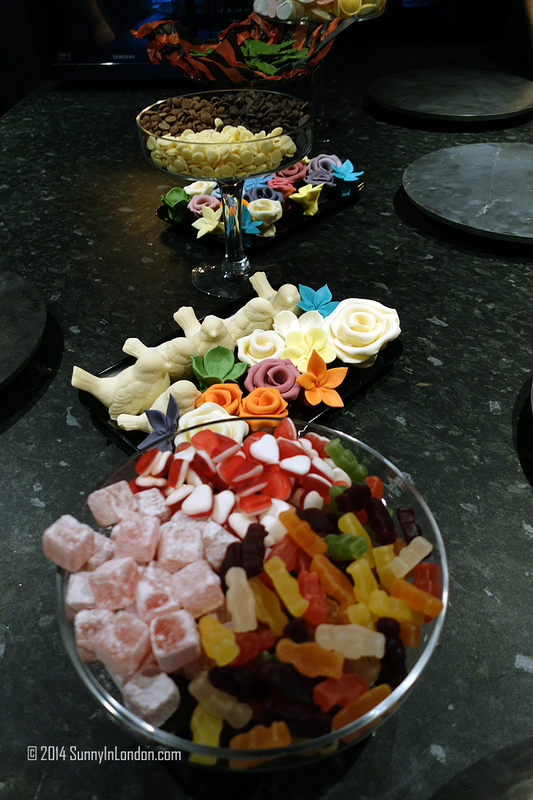 Before us was a table filled with chocolate coloured flowers, jelly beans, morsels, chocolate dust and more. I conquered the initial shock of the challenge and began to work. 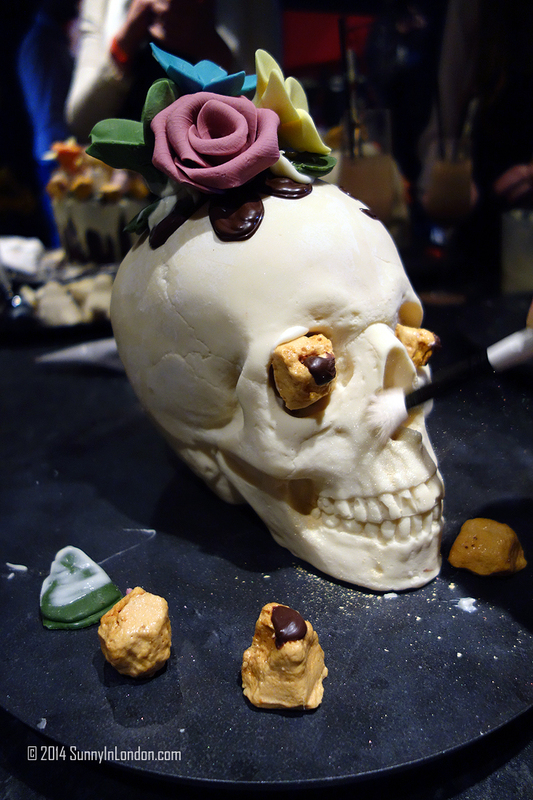 Let me tell you, figuring out how to make a chocolate skull look pretty ain’t easy, Sunny friends. I picked up my chocolate piping and started to draw. I have no artistic talent or training whatsoever. 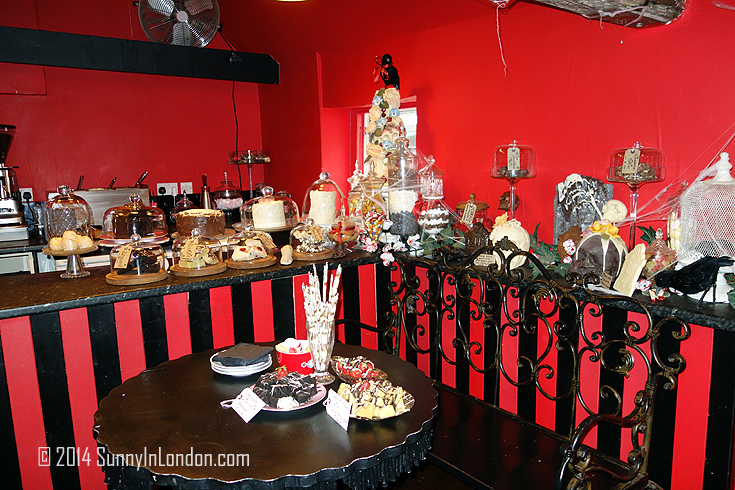 Good thing the super staff at Choccywoccydoodah were there to guide me along the way. 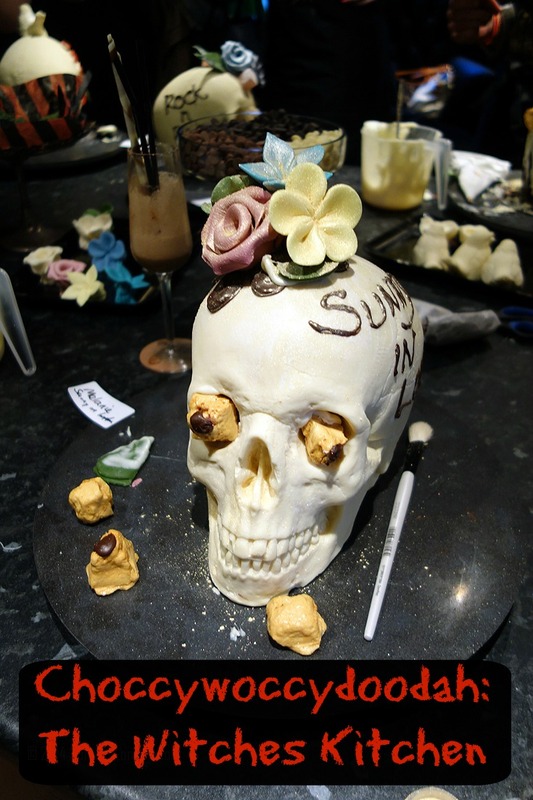 Once I filled in the chocolate flower ‘mini sombrero’ on my skull, I stuck some chocolate flowers on top. 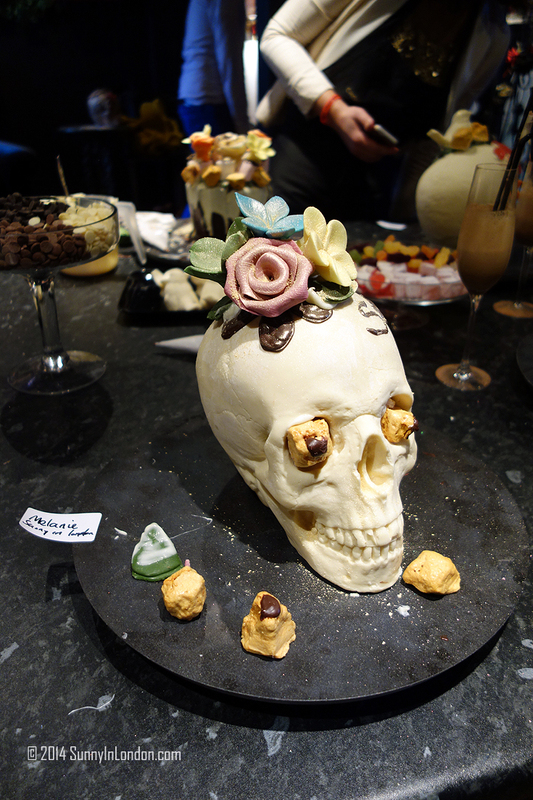 And then someone had the bright idea to make my skull a real piece of eye candy. 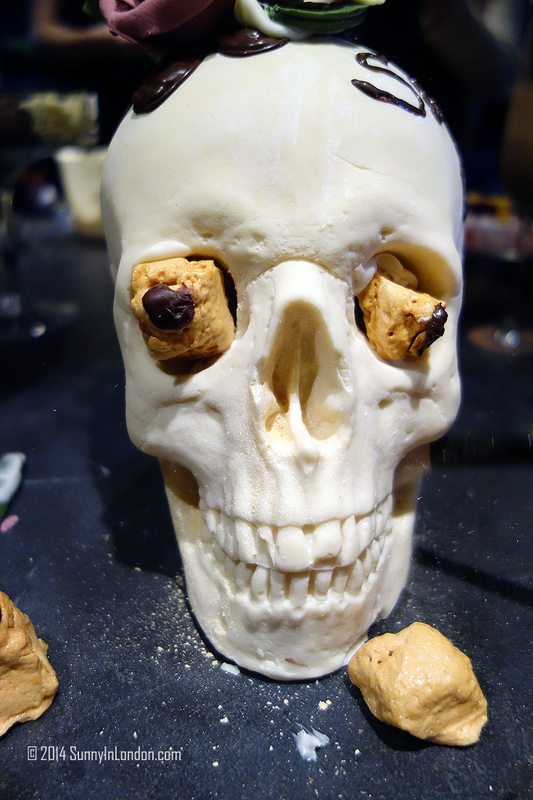 Yep, that’s two shots of honeycomb straight to the eye sockets. 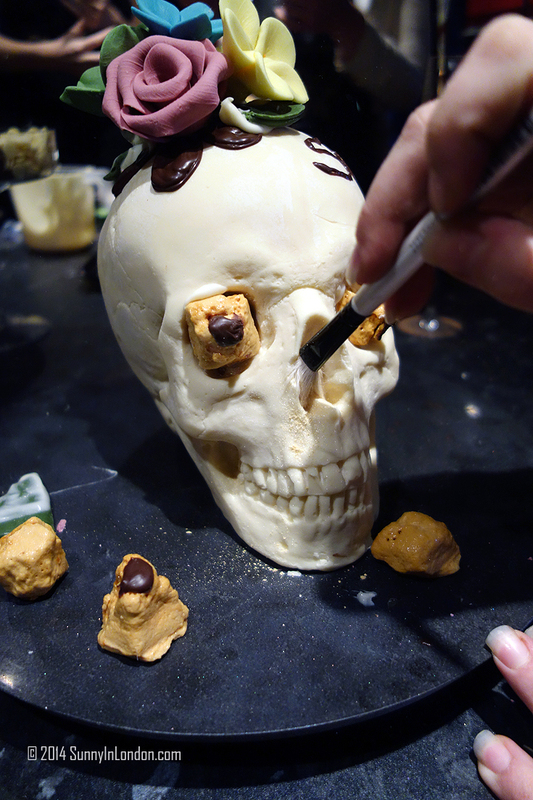 As if that wasn’t enough, I decided to really go for the gold and started dousing my skull with edible dust. I tried my best to arrange the chocolate in a fun, presentable way. And, of course managed to get some branding in the picture too! 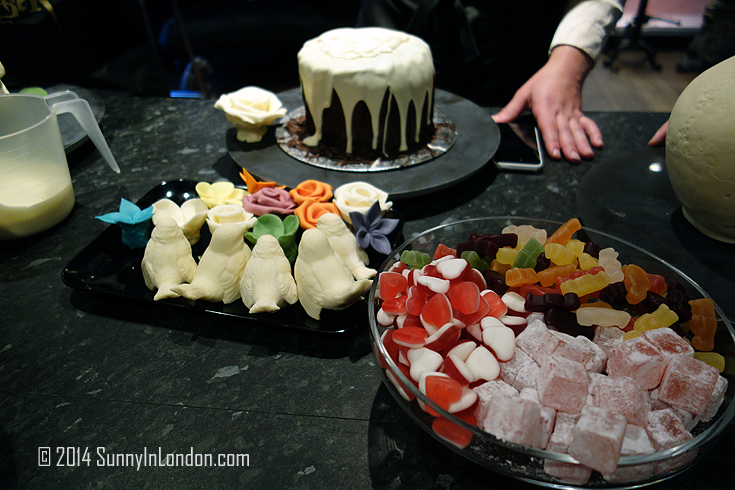 We were all proud of our creations, even the cake blogger. 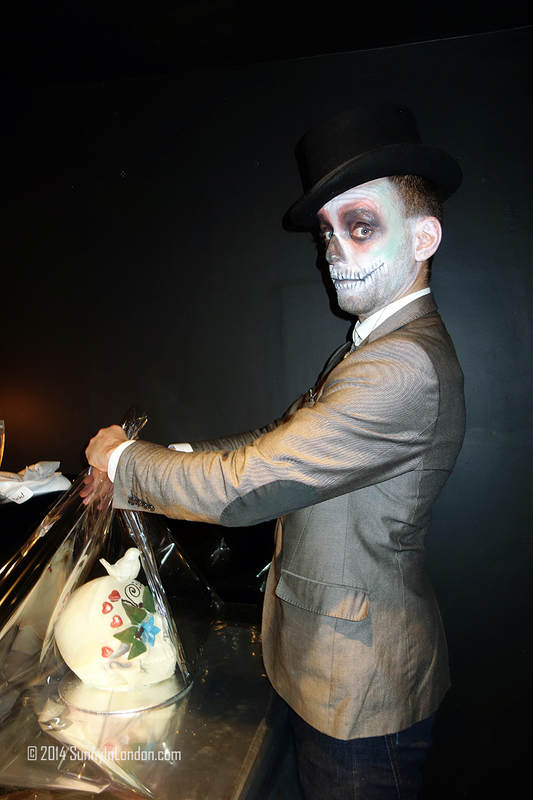 Next, we toured the many rooms in the café, while our creations were ghost-wrapped for our travels home. 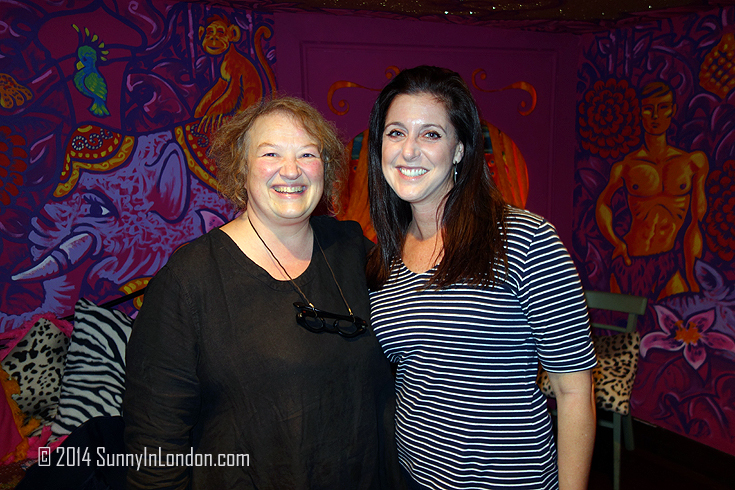 And just as I turned a corner, I met one the chocolate wonder woman herself- Christine! She graciously took a picture with me and made sure I was having a delicious time. The local television station captured her a few moments later. I tried to remain a cool cat about that. 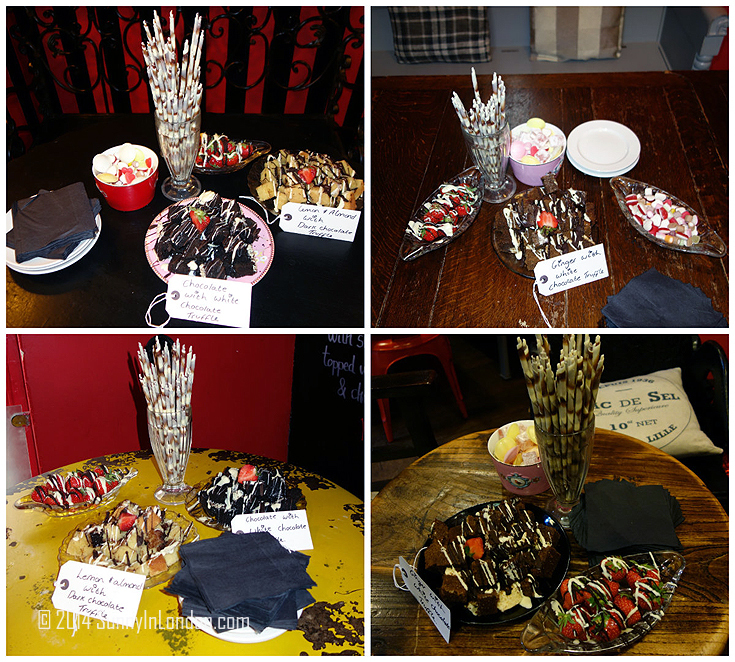 I occupied myself with these fantastic sights of a real world Chocolate Factory and continued to sample more of the chocolate pieces of heaven. 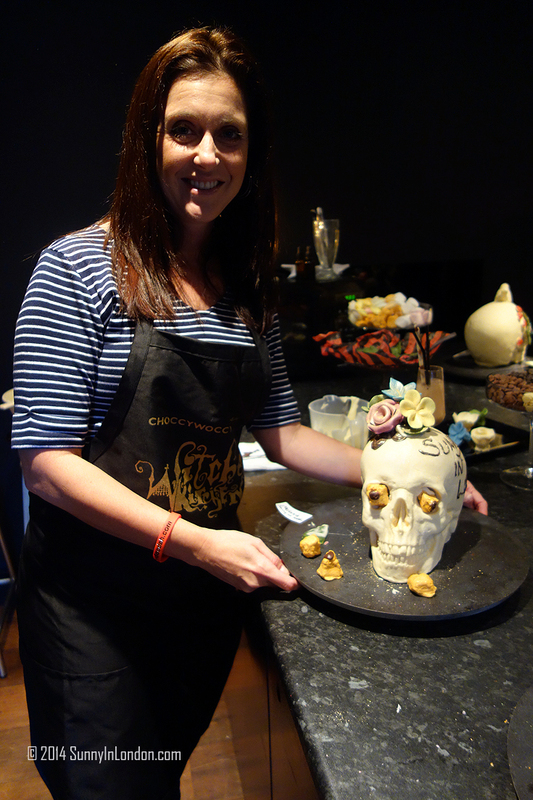 As you can see, the Witches Kitchen experience totally rocked. That is, until I had to carry my 3 kilogram skull to the Brighton train station and for two hours on the London Underground. I had the misfortune that evening of not being able to take the Northern Line home due to severe disruptions. Three trains later, with a lot of strange looks and very tired arms, I met Mr Sunny and proudly showed him my Halloween present. 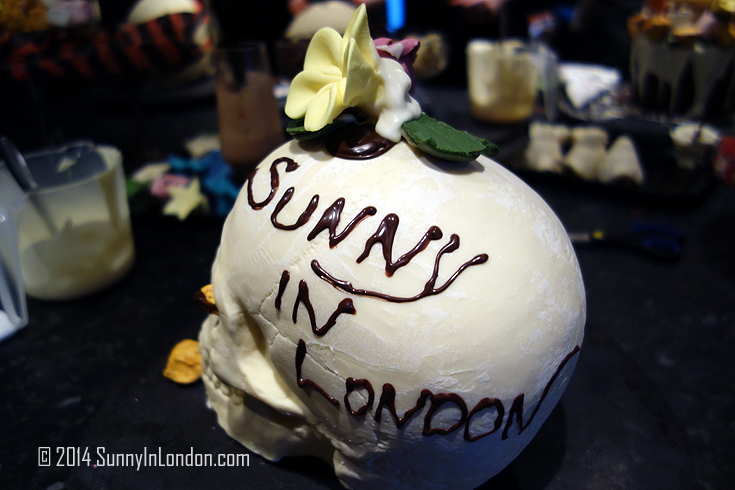 Sunny friends, there’s nothing that compares to carrying a solid chocolate skull for hours on packed trains. Perhaps that cake blogger wasn’t too silly after all. Their chocolate is simply to die for! 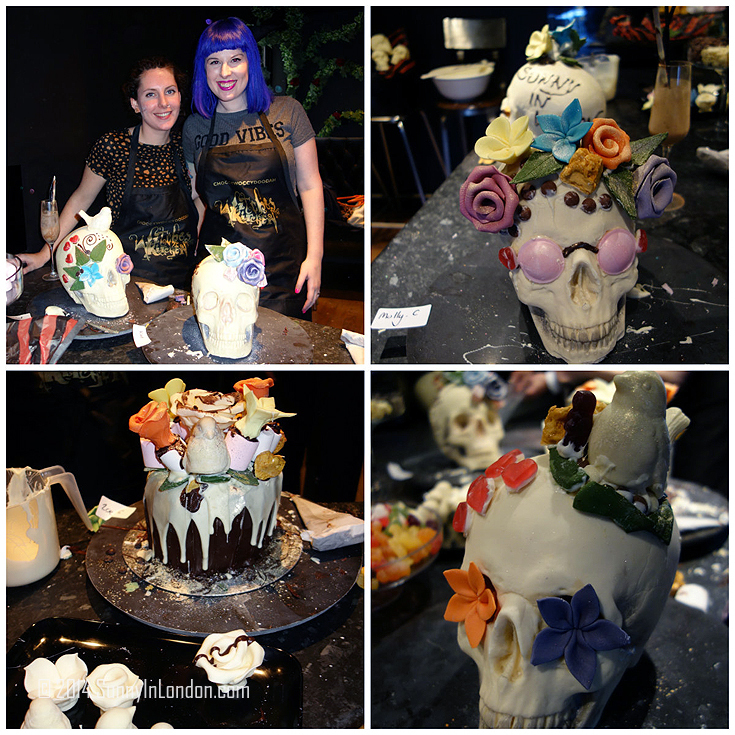 😉 You can read all about their use of Belgian chocolate and celebrities who have contracted them for cakes in my Choccywoccydoodah piece. And of course, you can get your own for Halloween, Christmas, Easter, birthdays or just a day you want a fabulous bit of chocolate. Follow them for news and mouth-watering pictures on Twitter, Facebook and Pinterest. 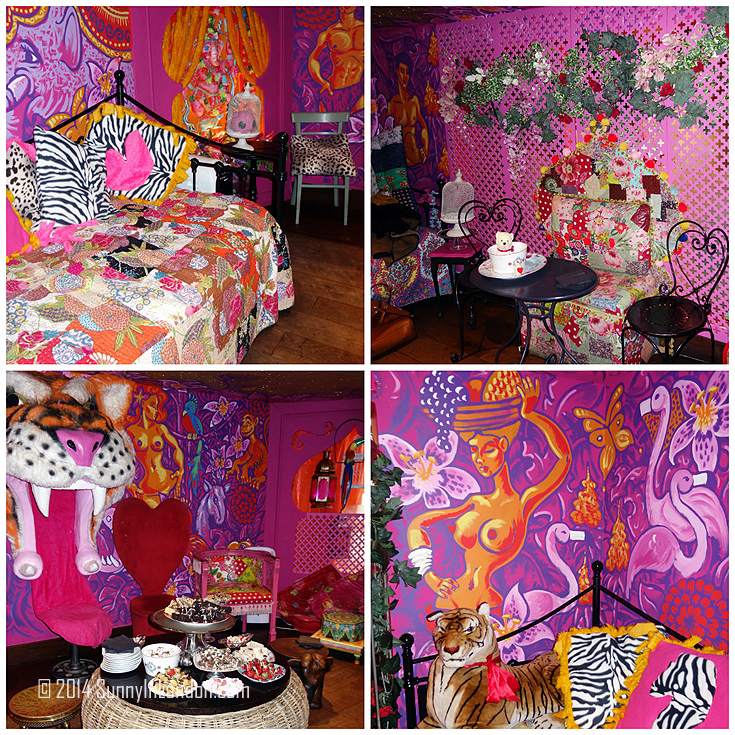 Oh my gosssshhhh – this place looks amazing!! I cant believe I haven’t paid them a visit yet, this is definitley next on my list! I’m actually watching the show as I type this. 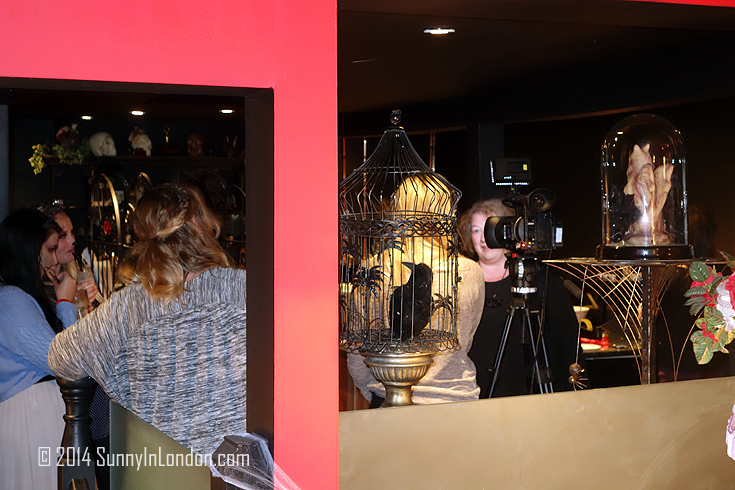 I always stop in for pictures (and a chocolate bar or two) in the Carnaby location. I truly love the Choccy team!